I thought it would be a good idea to take a break from the current depressing stories about doping and instead celebrate one of the brightest young stars in British sport. 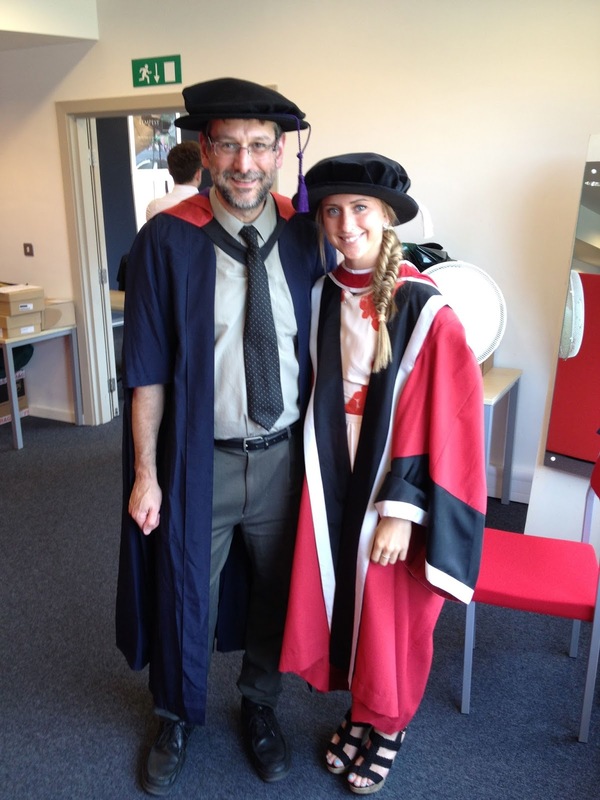 Yesterday my university, the University of Essex, awarded an honorary doctorate to Laura Trott, the cyclist. Laura was born in Harlow in Essex (hence the connection with the university). However, it has to be said that she really feels at home in Hertfordshire where she grew up. So much so that when the post box in Harlow was painted from red to gold in honour of her Olympic win, she tweeted the Royal Mail to move it to her home town, Cheshunt. In fact they just ended up painting another one in Cheshunt and kept the one in Harlow gold. As she then won another gold she now has three gold post boxes, two in Cheshunt and one in Harlow, more any other Team GB Olympic athlete (though the Paralympians Sarah Storey and David Weir have four each). Anyway the rest of the blog is my oration in her honour. I should say, referring to my last line, that when questioned later Laura was not keen on the current format being touted for a woman's Tour de France; but that's story for another day. Tomorrow I will post her far more powerful, and inspiring, reply. Thanks for coming to Essex, Laura! Chancellor, the Senate of the University of Essex has resolved that the degree of Doctor of the University be conferred upon Laura Trott. In 1992 as part of my Medical Research Council Fellowship in the Paediatric Department at University College London, I studied the health of premature babies in the hospital special care unit. I marvelled at the resistance and strength of the human spirit, both of the children and the parents, in coping with such adversity. Little did I know that up the road in Harlow, Essex, a baby was born one month prematurely who would more than emphasise this spirit and endurance. Laura Trott was born with a collapsed lung, leading to a six-week stay in intensive care. Later diagnosed with asthma she was recommended by doctors to take up sport to help regulate her breathing. Trampolining was one of her early loves, but she had to give this up after a blackout forced her to stop. Trampolining’s loss was cycling’s gain. The Trott family originally took up cycling to help their mother lose weight. These health benefits soon turned into a love of the sport, and both Laura and her older sister Emma became elite cyclists. Her father was also an inspiration. As Laura said in a recent interview “My Dad is properly mad about the sport and seems to have an answer for everything”. As a father of a daughter about the same age as you Laura, I can reveal that my daughter often says that I am mad about sport and have an answer to everything. But, unlike you, I don’t think she is being complementary when she says it. Laura grew up in Cheshunt in Hertfordshire, where she attended Turnford School. At the age of 11, she came third in the Boys and Girls Omnium at the British National Track Championships a feat she repeated when she was 16 in 2008, when she came third in the Junior sprint category. Actually finishing third in these British championships is not such a bad place to be. A quick look at the bronze medallists reveals names such as Chris Hoy, Bradley Wiggins and Jason Kenny. Or rather, as we should now say, Sir Chris Hoy, Sir Bradley Wiggins and - Jason Kenny. Arguably Laura’s rise to success from these championships was even more meteoric than these other luminaries. Those bronze medals were the start of a road that would culminate last year in a Velodrome in a certain Olympic park 45 minutes down the Colchester train line to London, of which more later. In 2010 Laura was part of the winning British team pursuit trio at the European Championships. She followed this up in 2011 with wins at the Under 23 European championships in the Individual pursuit, scratch race and the team pursuit. In the same year she again won the team pursuit at the European Senior Championships – as well as the Omnium. These successes were just the tasters for 2012. In April last year, Laura won gold in the team pursuit and the omnium in the World Cycling Championships in Melbourne, Australia. She competed in these same events in the London 2012 Olympics. First came the Team Pursuit, where, along with Joanna Rowsell and Dani King, Laura won gold in a world record time. In fact that Olympic Gold Medal ride was a culmination of six successive rides from that trio, that that each in turn broke the world record. So on to the Omnium. For those of you who don’t know, the Omnium is cyclist’s multi-event equivalent of track and field’s heptathlon, making Laura the cycling equivalent of Jessica Ennis. The events in the Omnium are the Flying lap, the scratch race, the elimination race, the individual pursuit, the points race and the time trial. Like most of us watching Team GB last year I became an overnight expert in cycling, whether it is the exact speed of that funny little motorbike (or Derney) that leads out the Keirin or the precise time to pounce off the bend in a one-on-one sprint. But the points race? What’s that all about? A lot of cyclists seem to go round in circles and then one of them is declared a winner. I had no idea what was going on. So I was pleased when I read one of Laura’s recent tweets that simply said: “Absolutely carnage points race tonight. Just glad I stayed upright!”. Still I had a flash of inspiration when I was watching the Omnium at the Olympics. A voice in my head said “Don’t worry about understanding what’s going on. This is Laura Trott. She won’t let us down. And of course she didn’t, duly winning her second Olympic gold medal for team GB in the Omnium. I have made these victories seem like an easy path to success. Let me assure you, they are not. As well as managing her asthma through the grueling training sessions and competition races, Laura has had to overcome an additional health problem that often results in her being physically sick after races. Still, Laura would be the first to admit that – as well as her parents – there are many other people responsible for her success. One of the features of the heady sporting days of last summer was the long list of names our Olympic medalists recited when asked to comment on how they had achieved their wining performance. Laura is part of the phenomenally successful UK track cycling team based in Manchester and led by Sir Dave Brailsford. Success at the elite level no longer relies on a lone coach to help an athlete; there is an extensive support team of performance analysts, physiologists, biomechanists, nutritionists and psychologists. Today, as well as Laura, we have awarded degrees to University of Essex sports science undergraduate and postgraduate research students who have studied in these same areas. Our Human Performance Unit (the HPU) at Essex tests and supports athletes, both ordinary and elite, and we are fortunate today that Laura honoured the HPU with a visit. Some of the work of the HPU is at the experimental research stage, with the ultimate aim of designing new ways to improve the performance of athletes, from speed skaters to hockey players, rugby players and triathletes, including of course those who, like Laura, may one day contribute to the success of Team GB. Today Laura will become a member of our academic community. The future for our new Essex doctor is bright. Laura has moved on from her London 2012 success, winning gold at the team pursuit and silver in the Omnium at this year’s World Championships. She is committed to repeating her Olympic success at Rio in 2016. She is still only 21. Rumour has it that she might have the long-term aim of eclipsing Sir Chris Hoy as the country’s most successful ever Olympian. Laura has also joined the women’s road racing team sponsored by the current Tour de France winner Sir Bradley Wiggins. A full-length women’s version of the Tour de France is long overdue. Perhaps its first winner could be a University of Essex doctor? Chancellor, I present to you, Laura Trott.